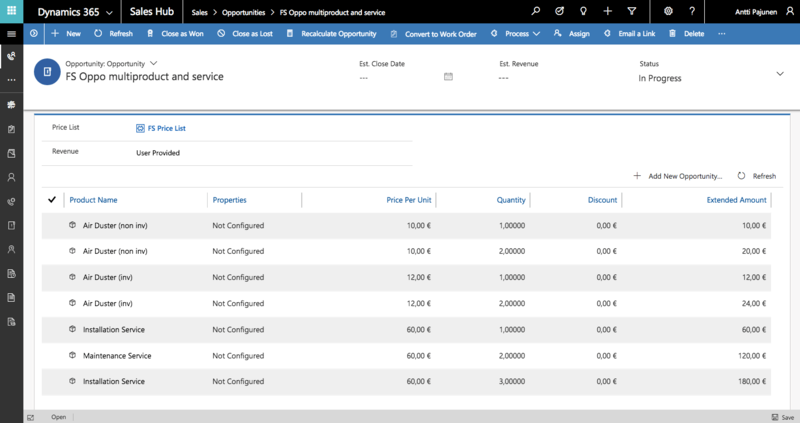 A common customer scenario is one where a core Dynamics 365 Customer Engagement Opportunity form is in use for a sales process. “What do we do with our Opportunity form” is a question that arises in almost every Field Service and PSA implementation where D365 CE is already in use. As Field Service and PSA have their own forms due to their own logic and the “Field Service process” and “PSA process”, the Opportunity forms can be a slight headache. If you want to stick to the core CE Opportunity form and you’re sure you have no need for the app specific one, this blog post will introduce you to an idea that allows you to pull products from Opportunity Lines to your Work Order Services and Work Order Products with Flow. No code is needed to accomplish this! The Flow fires off when an Opportunity is closed as won. Products set on Opportunity Lines will be pulled on the Work Order Product and Work Order Service entities, after a Work Order is created. As Field Service has Inventory, Non-Inventory and Service products, these different options are identified at the Switch Case section of the Flow, before Work Order Services and Work Order Products are created. For more information about Switch Case, please see this post by Flow’s PM Stephen Siciliano. Products are added on Opportunity Lines and the Opportunity is closed as won. The Flow executes and creates a Work Order, Work Order Services and Work Order Products. 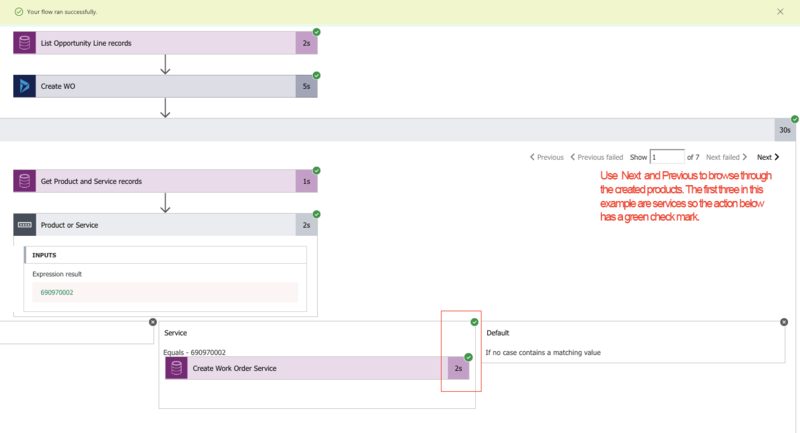 The Work Order has all the products from the Opportunity Lines on the related WO Service and WO Product entities. 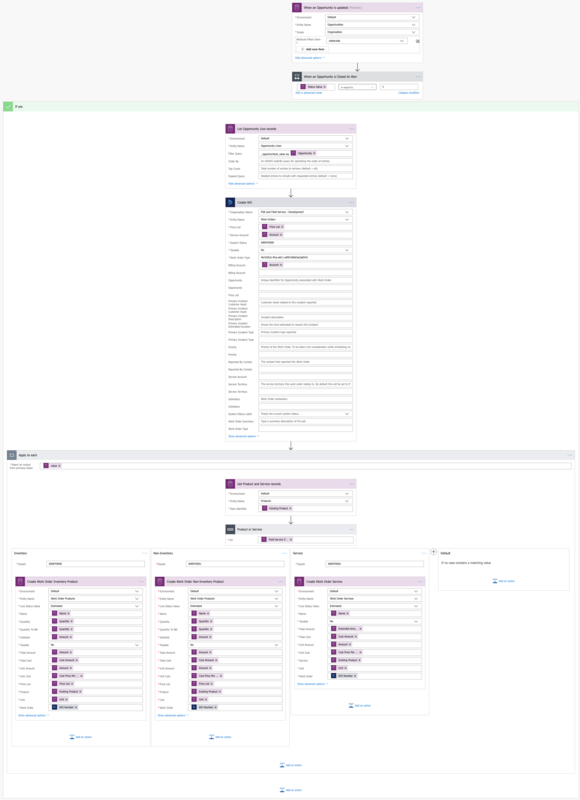 As always, this Flow can be found from the Those Dynamics Guys PowerApp Bank here. Huge thanks to both Elaiza Benitez and Kimmo Koski for their help.